With 28 years of rich musical history the Band is proud of its heritage and its association with the town of Tenbury Wells, the Teme Valley and surrounding area. The Band gives high quality musical performances at concerts, fetes and charity events and looks to the future, with enthusiasm, with the formation of its exciting Academy. 2016 was the Tenbury Teme Valley Band’s 25th Anniversary Year and there were exciting events and celebrations including a spectacular concert at the Regal Theatre and a celebratory meal. The Band performs music from a wide variety of different genres including classical, rock, popular, music from the shows and original works. Tenbury Teme Valley Band is a Symphonic Concert Band, as all woodwind and brass instruments are played. In 2018 Tenbury Teme Valley Band proudly continued to raise considerable amounts of money for the following charities: the Green Fingers Charity (which provides sensory gardens for children’s hospices), St Mary’s Church Tenbury Wells, Coreley Memorial Hall with St Peter’s Church Coreley, Tenbury Royal British Legion Poppy Appeal for the end of World War One Commemorations, Childhood Leukaemia and the Pamela May Charity (a new narrow boat for use by people with disabilities). 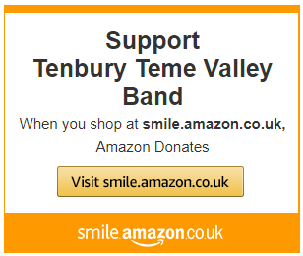 We hope that you will enjoy browsing through the pages to find out more about Tenbury Teme Valley Band. Tenbury Teme Valley Band provides the opportunity for musicians to play together, gives musical training and performs high quality music for functions and events. The band welcomes players of all ages and abilities to join. Rehearsals are held at Tenbury Primary Academy on Saturday evenings from 5.30 to 8.30 with Academy (for anyone wishing to learn an instrument) from 5.30.